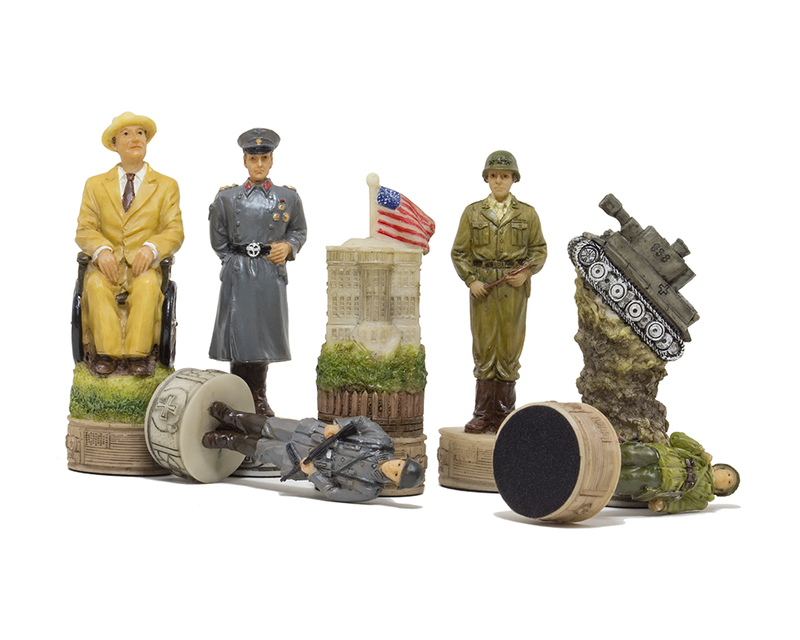 President Franklin Delano Roosevelt served as the US President from 1933 until 1945 and heads this American force. 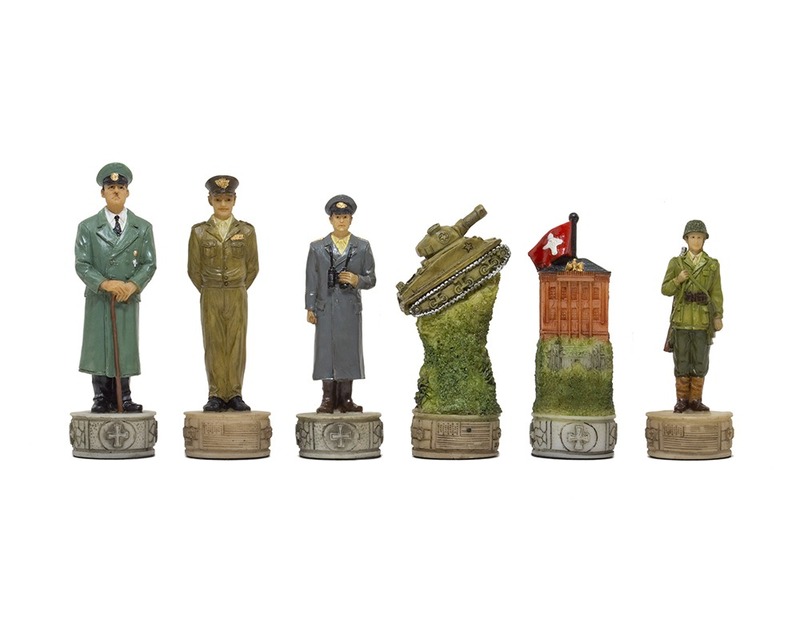 His right hand man is potentially the high ranking Sergeant Major of the Army, whilst the bishop stands proud as a platoon sergeant major overseeing ranks of the smartly dressed pawns. 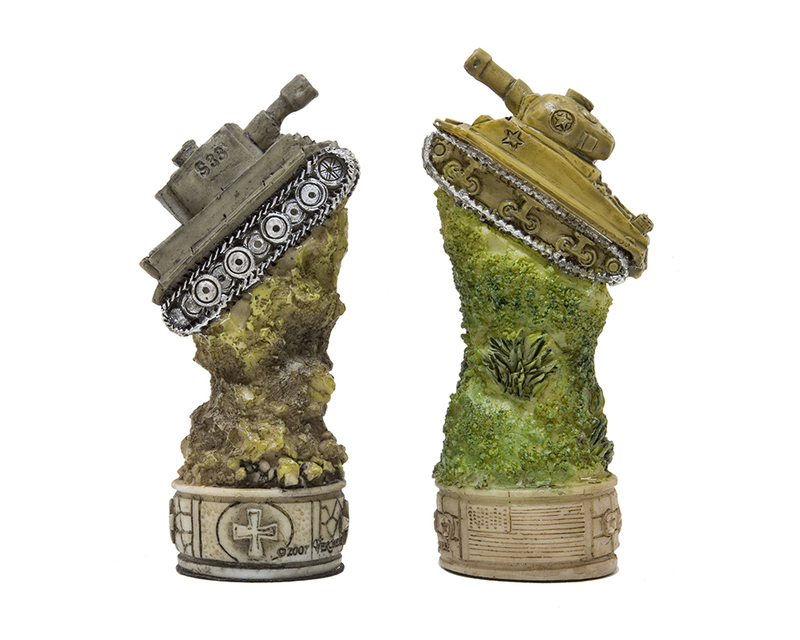 The rooks and knights are the exciting pieces in this set, portrayed as the flag bearing White House and quite a dramatic tank. Hitler is easily recognised with his trademark moustache and haunted look. He is flanked by high ranking officers either side, both of which are incredibly detailed. 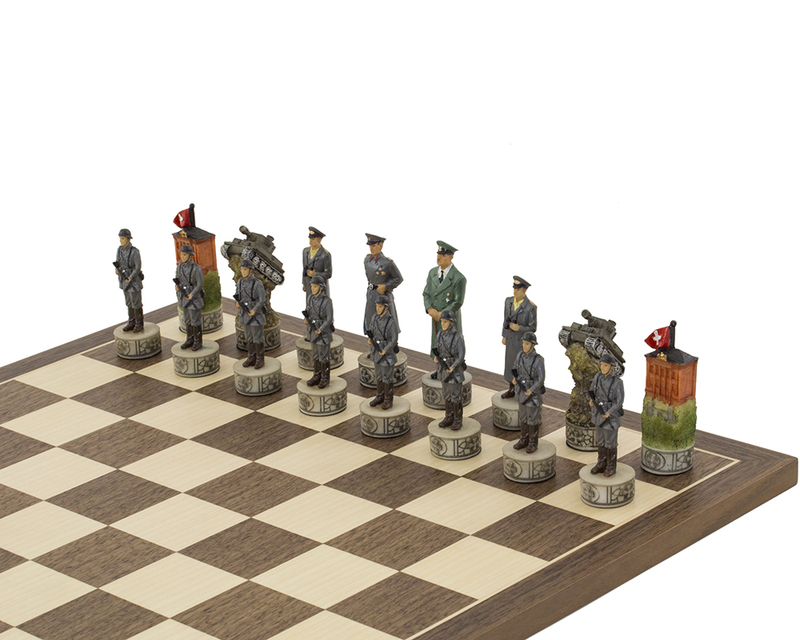 They in turn oversee the rank of smartly uniformed pawns who are presenting to arms. The rook is a superbly detailed building bearing the Swiss flag which we believe to be Reichstag Building. Again a spectacular tank represents the knight. 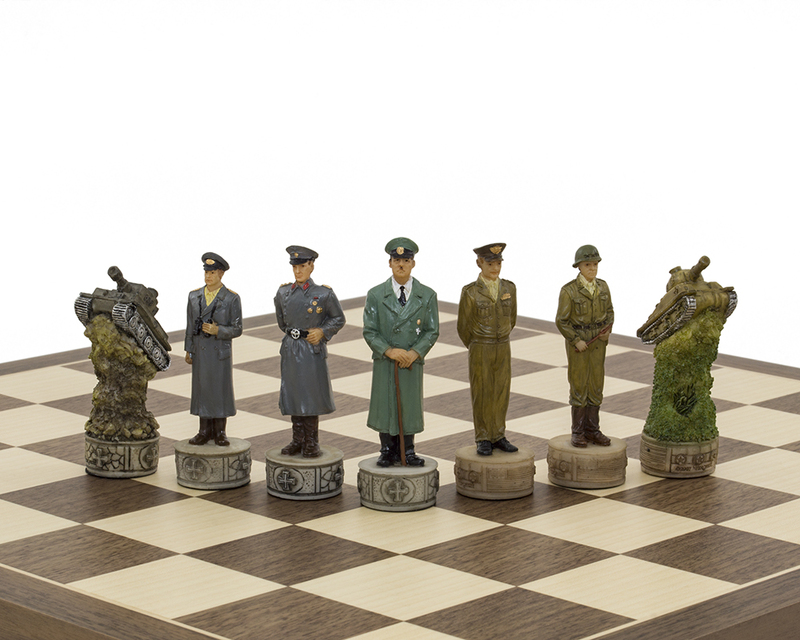 We have matched these lovely historical pieces with a stunning 16 inch walnut and maple Spanish board to give you The Hitler Vs Roosevelt, second world war hand painted themed Chess set. 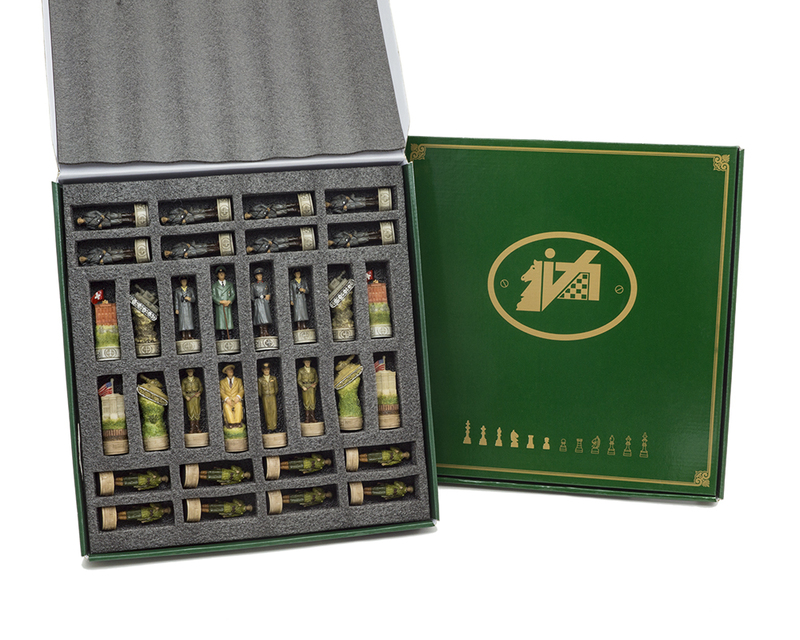 With or without the board, this makes a perfect gift for a World War II or chess enthusiast. With World War II looming, President Roosevelt gave strong support to both the UK against the Nazi German aggression and to China against threats from Japan. He tried to stay officially neutral, however following the tragedy at Pearl Harbour, the US declared war not only on Japan but also Hitler a few days later. Despite his disability from polio, his efforts during the war were not just his brilliant military strategies. 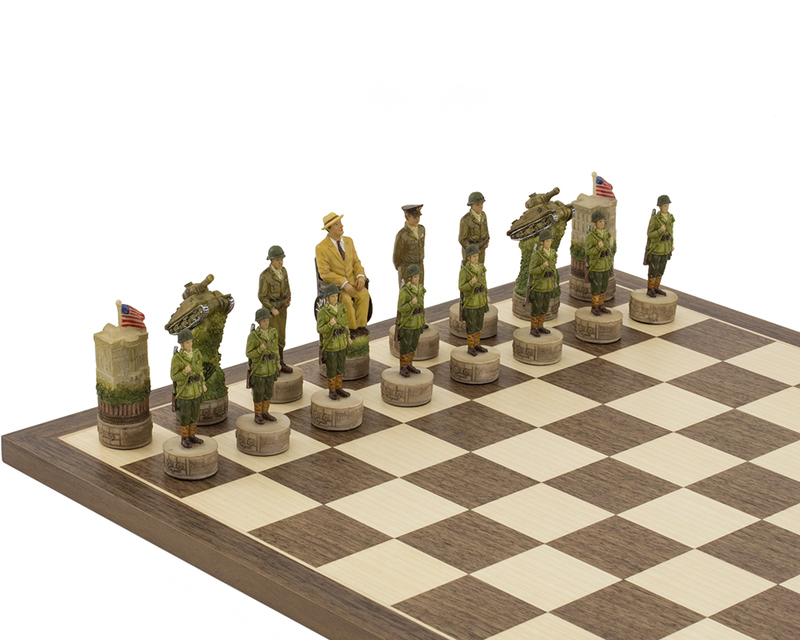 Employment rose as people moved into wartime factory jobs and into military service. This led to a stabilisation and significant improvement in the economy. Unfortunately Roosevelt’s health declined during the war years and he passed away 3 months into his 4th term. When Roosevelt died the world mourned. He is ranked in the top three of American Presidents along with George Washington and Abraham Lincoln.